Title: I Wrote This for You. Publisher: Word, Rhyme and Rhythm, Abuja. Due for release on: August 19, 2017. I wrote this for you starts as little droplets of beautifully woven words before gradually building to a rain of encouragement. Every now and then, alternating between the first person narrative and the second person, one sees pain through the eyes of the writer, and feels the torture of all that she has been through. Written as a collection of poems and quotes, the first and most noticeable strength is the clever wordplay that survived till the last page. The poems, seem unknowingly divided into four parts, although it is unclear if this was the Writers’ original intention or if by some literary miracle, the poems aligned in poetry heaven. The first set of poems talked about the acceptance of pain, in all its ramifications, emphasizing the need to let pain break and heal one. The writer allows the reader connect with pain in all its forms and masks, allows the understanding that it is okay to be beat, and sad, and hurting. It also allows the reader to understand that it is okay to drop those masks and breath. The second part centers on self-love. Allowing the reader recognize the importance of taking moments to applaud personal victories, be they mighty or little. Here, the book touches on love and loving and letting go of toxic relationships and partners. You are welcome to stand behind me. I WANT you to stay, but I don’t NEED you. These words describe how infinitely, all you have to give yourself is you. How although it is beautiful that one tries to be a super hero, loving others, saving the world, it is important to save oneself for one; keep some of you, for you. Interestingly and quite refreshing were the poems dedicated to God. Perhaps if we all saw God as the friend that the poems suggest, just maybe our prayers would be answered faster. Or at least waiting on those prayers would be much easier. And perhaps just maybe, all those long nights tagged insomnia are nights where God calls on us; Let’s talk, What’s going on? 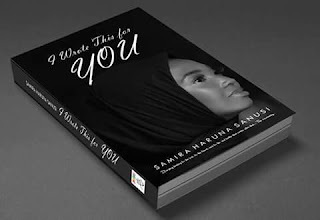 The ending poems and quotes were dedicated to our unsung heroes; to the women who are yet to truly and honestly answer the question, who am I without my fathers’ name and my husbands’ last name, and the men who break in silence. One explores societal labels, expectations and how all that should fall behind as self-love and self-appreciation takes on our decision wheel. The book closes with the words of Dr. Haruna Usman Sanusi where he picks on the suffocating state of the Nigerian System; the poor blame the rich, who blame the government, who blame the people, the economy and the Naira which inevitably leads to the compromise in values, degeneration of living standards and this intolerance one experiences in the society. The little mishaps would surface in the use of popular lyrics like Jason Derulos’ Kiss the sky, and Rihanna’s Shine like diamonds, even as the world has cried about the inability of diamonds to shine. Again, perhaps the lines found their way into these poems and stayed, or perhaps they are materializations of the writers’ playlist. However, this remains a true path to self-appreciation and wealth of motivation. We are grateful that this was written for us.